DESIGNED FOR EASE OF USE & CLEAN UP: With scalloped steel heads coated in silicone, Joyoldelf’s tongs tips are firm and angled to offer amazing grip and control. They’re heat resistant to 480°F so you can grab and flip in the hottest environments. They’re non-stick friendly to protect your expensive pots and pans. The handles have soft ergonomic grips, and the ring pull lock means easy storage. Clean up is a breeze – simply wipe under hot water or throw them in the dishwasher. BEST QUALITY PARTS AND BUILD THAT WILL LAST YEARS: Joyoldelf’s premium tongs are made with extra thick 1.00mm stainless steel from the handles all the way to the scalloped steel heads, which are then hygienically coated in silicone so there are no removable parts for bacteria to grow. And the ring pull locking system has special brackets to ensure a smooth, durable action that will last years. PREMIUM SILICONE: It’s heat resistant to 480°F, and stain and odor resistant. 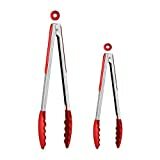 Joyoldelf’s tongs heads offer the best grip and control available, and simply won’t melt, warp, rust or flake into your food like cheap metal or nylon plastic tongs. EASY TO USE:Slip-free grip for a safe and comfortable use, Great for grills, ovens and barbeques. Use different tongs for meat and vegetables. AMAZING GRIP & NON-STICK FRIENDLY: With scalloped steel heads coated in silicone, Joyoldelf’s tongs with silicone tips are firm and angled to offer amazing grip and control. Just compare them to your old nylon tongs or plastic tongs – these are the best tongs for cooking, grilling meat, or use as serving tongs or salad tongs.